The Wells Fargo Propel American Express Card currently has an Informr score of 8.5 out of 10. This score is based on our evaluation of 27 sources including reviews from users and the web's most trusted critics. 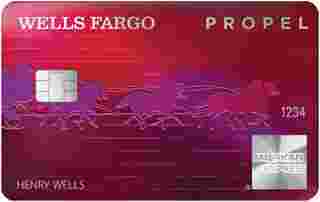 Wells Fargo Propel American Express Card is typically available to those with good credit scores (650 or greater). The Wells Fargo Propel card is a solid travel rewards card. So it has a large rewards rate of return with no annual fee. Additionally, it’s also flexible when it comes to the way you redeem your points. So if you have good or excellent credit, you should apply for this Amex Propel card. Intro fee is 3%, minimum of $5 for balance transfers made in the first 12 months. Enjoy a complimentary bottle of wine, appetizer, or discount on your meal at participating restaurants. Occasional travelers and those who are looking for an introductory rewards card should give the Wells Fargo Propel American Express® Card a chance. The rewards program, travel and purchase protections, and cell phone protection, all with no annual fee, makes this card a great choice. You might get better perks, like higher cash-back percentages or airport lounge access, from another card, but the Wells Fargo Propel American Express® Card is full of upside for the frugal-minded. With a generous rewards rate that awards bonus points in popular categories, the Wells Fargo Propel American Express card is one of the best no annual fee travel cards available. If you are eager to start racking up rewards points toward your next vacation – but not ready to spend $95 a year or more to do so – the Propel is a great option. The Wells Fargo Propel American Express Card doesn’t dominate the credit card universe in any particular category. That includes the sign-up bonus, rewards points, the 0% introductory APR, and the many additional features and benefits it offers. But it is very good in each of these categories, which makes it a credit card worth having. When you consider the fact that most credit cards with any good benefits to speak of charge an annual fee upwards of $95, the Wells Fargo Propel is a bargain deal. You can still earn as many points as you would on another card, with the added incentive of getting cash back and earning 3x the points in certain categories like dining, traveling, and popular streaming services. Wells Fargo Propel American Express Card is one of the best cash back credit cards on the market. For a no-annual-fee card, the rewards are very generous. You get 3x points in many popular categories, making it a great, well-rounded card. We think that for almost anyone, this is a great addition to the wallet. If you’re willing to overlook customer service reviews and want to earn rewards in certain categories, the Wells Fargo Propel American Express Card may be a solid choice. You’ll likely get a lot of value from the card if you use it frequently to earn 3X points for gas, dining out, or travel. And, if you want a card to earn rewards on streaming services, this is one of the few you’ll find with that bonus category. Look, the Wells Fargo Propel Amex Card isn’t a game-changing card. However, it offers some compelling 3X bonus categories that will be useful to many people and the Go Far Rewards program is simple to use. While this might not help you fly Singapore Suites, it can be quite useful for cheap economy flights. The Wells Fargo Propel Credit Card offers one of the best packages on the market for a fee free personal card. The Propel is a really simple card, and while it’s certainly not as lucrative as a Chase trifecta or a premium travel card like the Amex Platinum, it’s a great offering for anyone who wants to keep things simple.